Also Called: Nuttall's mock bishop's-weed, laceflower. Stems: Erect, slender, branched above, glabrous. Leaves: Alternate, 2-3 times pinnately compound, 1.2 to 4 inches long, narrowly egg-shaped in outline; segments thread-like, .4 to 2.4 inches long, not crowded, alternate or opposite on the rachis; stalk to .4 inch long; basal leaves usually absent at flowering. 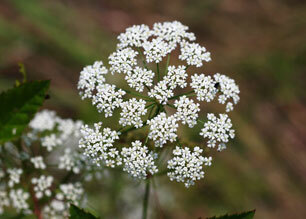 Inflorescences: Compound umbels, .8 to 2.4 inches across, terminal and in leaf axils; rays 4-30, slender, .4 to 1.2 inches long; flowers 5 to numerous in each small cluster; bracts 2-15, thread-like, usually entire, shorter than rays. Flowers: Small; stalks 1/8 to 1/3 inch long; calyx teeth conspicuous, narrowly triangular; petals 5, obovate, white; tips shallowly notched; anthers purplish. Fruits: Dry, tiny, round, slightly flattened, ribbed, glabrous, brown, straw-colored between ribs, splitting into pair of 1-seeded segments. Habitat: Low moist prairies, roadsides, railroads, stream banks, ditches; moist sandy or silty soils.